ALL or NOTHING staff are listed below, along with some miscellaneous information about each member! Jobs: Deck making, layout making, KAT-TUN, Casino, and JE games. A2. Too hard to decide. A3. 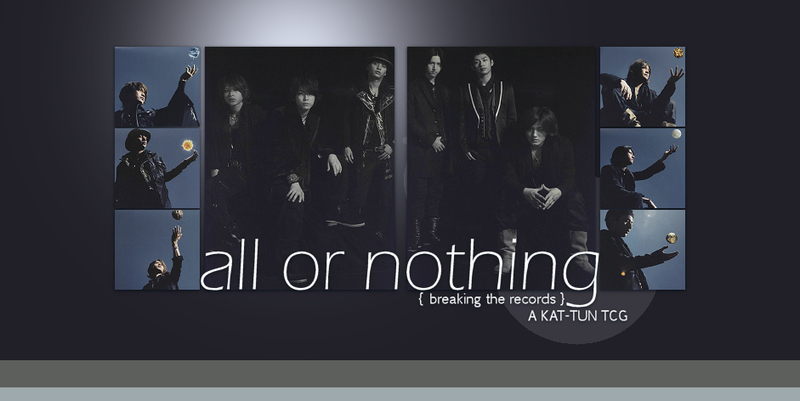 Best of KAT-TUN, for sure! Q4. Who in KAT-TUN would you want as a father? A4.Nakamaru Yuuichi, because he seems like he'd be a normal father. A5.Tanaka Kouki, because he just seems that way! :D And he can beat up all my bullies like, "Oniiiisan, tasukete (;_;)"
A6.NONE! They must all be older than me! But I guess Kamenashi Kazuya, just by default. At least I can scold him if he goes out and gets drunk again. Q10. If you could go on a date with any member of KAT-TUN to anywhere in the world, who with and where to? A10. Definitely... Akanishi Jin! And definitely to Cosmo World (especially the haunted house (reference to MEGUMI date)), because I doubt he got over his fear of ghosts and haunted houses, and it'd be so funny to watch him scream! :) It's okay to hold hands if you're scared! Jobs: Deck making, game updating, form answering, spell check. A10.Ueda Tatsuya, around the world in a hotair balloon! Please do not take any cards from here! This is for the staff only. Since Mi-chan is limited in which games she can play, cards are taken for updating games as well.